Pleistocene Re-Wilding: Environmental Restoration or Ecological Heresy? The saturated soils of the tundra zone tend to be infertile, incapable of producing nutritious fodder that can sustain substantial numbers of large animals. According to research carried out by Zimov and his colleagues, the waterlogged nature of the tundra is not a direct result of the local climate, which is still relatively dry: most of northeastern Siberia receives less than 250 mm (10 inches) of precipitation a year. The culprit, they argue, is the blanketing cover of moss. Non-vascular mosses have no roots, and thus do not pull water out of the soil. A thick moss layer is also highly insulating. As a result, both evaporation and transpiration are minimal, maintaining saturation over vast areas during the brief summer when the upper soil layer thaws. The key to drying out the soil, according to the Pleistocene Park advocates, is breaking up the moss layer. This is best done physically by the presence of concentrated herds of large animals for limited time periods, as their hooves effective cut through the fragile moss carpet. If the moss layer is adequately disturbed, grasses can gain a foothold. It is essential, however, to maintain grazing pressure; otherwise, dead grass stems and leaves will accumulate, insulating the soil and thus reestablishing conditions of saturation. Grasses are highly adapted to grazing pressure, having co-evolved with large herbivores over the past 25 million years, since the beginning of the Miocene epoch. Grazing, in turn, effectively recycles nutrients, as animal droppings form effective fertilizers, sustaining rapid grass regeneration. 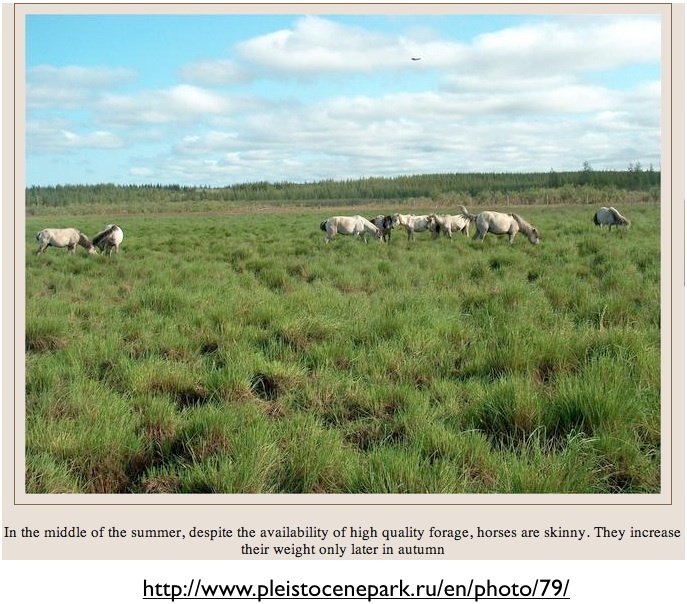 Over vast areas of central and northeastern Siberia, moreover, potentially fertile loess soils abounds, enhancing the region’s potential for supporting large herds of herbivores. Overgrazing is of course a prospective problem, which is precisely why Zimov wants eventually to reintroduce lions, tigers, leopards, and hyenas to the park. Waterlogged soils are also widespread in the taiga belt, although not as common as they are in the tundra. In the boreal forests, thick tree coverage presents another obstacle to the establishment of a diverse megafauna, as the mostly coniferous trees provide little food for large mammals. But once again, the cause/effect relationship is muddled. The presence of large mammals, particularly proboscideans (elephants and their ilk), reduces tree coverage; as we know from studies in Africa, as elephant numbers increase, forests tend to be replaced by open savannahs. Such parkland environments, in turn, are able to support much greater numbers of large mammals than forests. In Siberia’s taiga and especially in the forest-tundra transition zone, large mammals would trample tree seedlings and saplings, thus pushing the ecosystem as a whole toward more open, grassy conditions. Underlying the debate are fundamentally different perspectives on time. 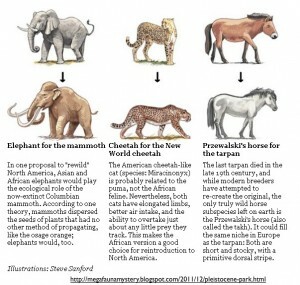 Environmentalist opponents of “Pleistocene rewilding” take as their base-line the recent past, the period immediately before humankind began its modern transformation of the Earth. Premodern ecosystems, they generally contend, remained in equilibrium, allowing the perpetuation of the magnificent diversity of life, each species remaining in its proper niche. By the same token, pre-industrial (or, in some version, pre-agricultural) peoples are thought to have remained in harmonious balance with their environments; deeply respecting nature, and firmly ensconced within its intricate webs, they were incapable of causing substantial damage. All of that was to change, however, as modern societies grew estranged from nature, and hence began to engage in destructive practices. Such devastating activities included the transfer of animals and plants from their proper habitats to new locales, place in which they simply did not belong. Exotic species, defined as those that did not live in a particular area within historical time, are thus taken to be unnatural threats to nature’s balance. Opponents argue that there has been more than enough time for communities to evolve in the absence of mega-fauna, and thus the reintroduction of large mammals could thwart ecosystem dynamics and possibly cause collapse. Under this argument, the prospective taxa for reintroduction are considered exotic and could potentially harm natives of North America through invasion, disease, or other factors. Rewilding opponents also tend to be skeptical of the idea that humans could have been responsible for the megafaunal extinctions, owning to the belief that primordial peoples lived in perfect balance with nature. If the Quaternary extinction event was a purely natural occurrence, such reasoning has it, then attempting to restock the lost animals would constitute unwarranted human intrusion into fully natural processes. Re-wilding proponents have a different perspective on time. 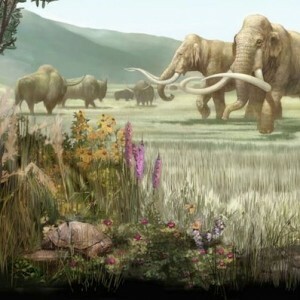 12,000 years, they argue, is but a moment compared with the 25 million years over which large mammalian herbivores co-evolved with grassy vegetation over most of the Earth’s land surface. Their opponents’ focus on the historical time period, and on maintaining the balance of pristine nature, seems to them misconstrued if not simply perverse. From the perspective of evolutionary time, perturbation and change are the norm; species come and go, continually moving from one landmass to another, retreating in some areas, while advancing in others. And even in the short time scale of mere hundreds or even dozens of years, nature’s harmonies tend to be more discordant rather than perfectly tuned, able to accommodate change—such as the introduction of new species—with little threat of systemic collapse. Yet through all of those transformations, what had remained constant—to the end of the Pleistocene epoch—was the presence of diverse assemblages of large animals on all continental landmasses. Restoring nature, they therefore contend, necessitates restocking those forms of life to the greatest extent possible. It is essential to realize that the “timeless balance” approach forms the dominant strain of environmental thinking, whereas the “rewilding” school represents a radical if not heretical departure. 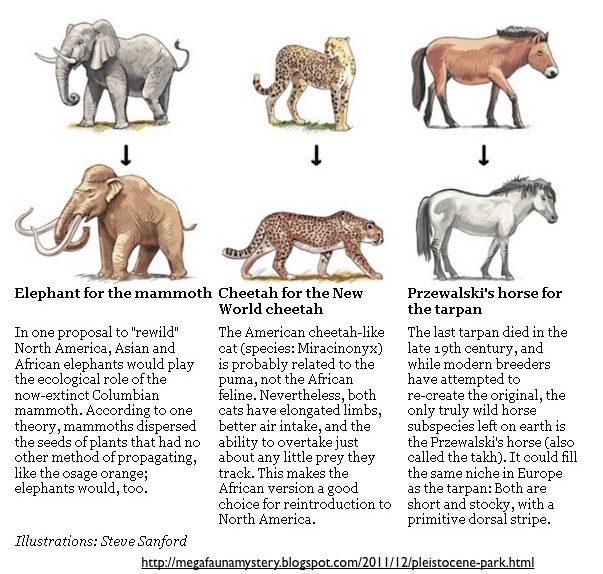 Most American environmentalists, for example, would be aghast at the prospect of releasing elephants in the Everglades, camels in Death Valley, or tapirs in coastal California, but that is exactly what Pleistocene enthusiasts would like to do. 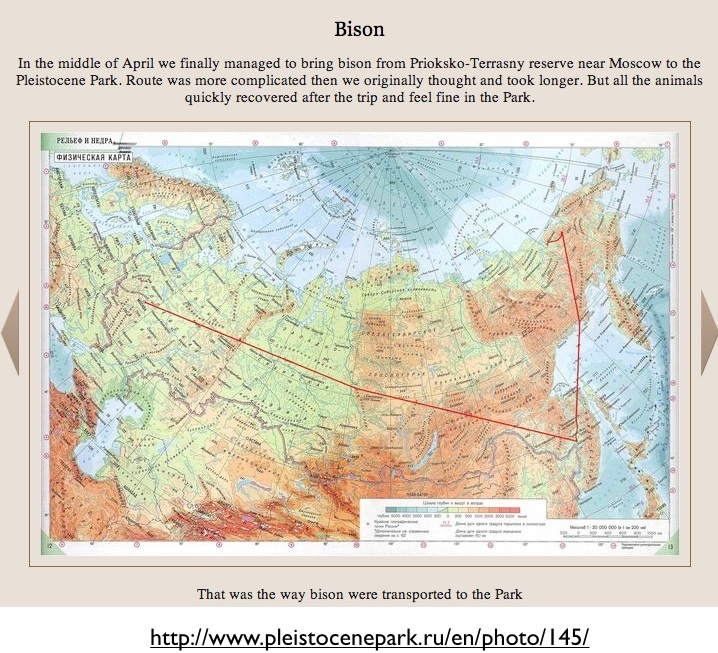 Or consider the attitudes of the two schools to a mossy, wet tundra landscape in northern Siberia or Alaska. To most environmentalists, such an environment is a precious survival of pristine nature in a human-wracked world, intricate in its balance, and highly vulnerable to human-generated disturbances. To ardent re-wilders, the same habitat is seen more as a biologically impoverished wound on nature generated by an episode of mass-extinction—humanity’s original sin. Best to lance such a sore with the hooves of herbivores, trucked in by the contrite descendents of the Pleistocene megafauna’s exterminators. *Climate change issue can also be used to argue against such a proposal, as the draining of saturated soils would result in the oxidation of peat, releasing carbon dioxide. Discussions of the climatic ramifications of potential landscape change in Siberia quickly become highly technical, focused on the fate of yedoma, organic-rich Pleistocene loess permafrost deposits, which are thought to sequester a massive amount of carbon (500 Gt). **Admittedly, much of the debate over mustangs has nothing to do with these positions. Ranchers often want to eliminate wild horse because they compete with cattle for forage, while many mustang enthusiasts are simply horse lovers and animal protection advocates unconcerned with ecological and evolutionary arguments.